As the name suggests ("light-dark"), the use of chiaroscuro in visual art is a method of "pointing" to a subject. The other side is that, with our visual-based knowledge of, say, how a complete arm and shoulder look, our eyes automatically fill in the blanks of the obscured portion of the figure. With Tenebrism, the more exaggerated practice of this method (usually associated with Caravaggio), artists work with the juxtaposition of a single blanched, bright light source against intense darkness. 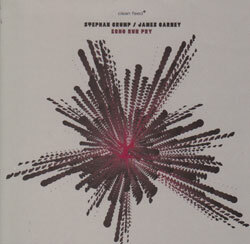 This idea of shadows, foreground and space, each playing equal roles in the mind's eye, permeates pianist James Carney and double bassist Stephan Crump's improvisations in myriad ways, the most obvious of these being that Carney and Crump's first few meetings involved two other musicians. Often, the duo leaves a curious spaciousness to suggest, "Something goes here, what do you think it is?" or invisible, felt-not-heard pulses; during the occasional rapid passage, Carney and Crump might adopt the diminished capacities they would play with a large ensemble (i.e. staccato chords, rhythmic patterns cut short). By no means does this imply that anything is absent in the music: this is a fluid mastery and understanding of gaps and what to do with them. Internally, the thorough ingress and egress of timbral inquiry and genre jumps further skews / highlights the sonic slight of hand. They patch together hard bop "walking" lines, Webern-style Pointillism, Japanese scalar excerpts, an exploration of harmonics, a sickly sweet Gershwin tenderness, rattling piano (at one point, Carney empties his pockets over the soundboard), drones, canonic fugues and wiggling gestures that defy definition. And they show restraint in this potential abyss: Carney and Crump aren't pushing for wild exaggerations, bizarre extensions or a schism from / dissolution of existing musical principles, but new voices within an archetype (see Morricone's "instant composition" work with Gruppo di Improvvisazione Nuova Consonanza for more examples of this methodical hunt for intrigue, not bombastic anarchy, amidst relative chaos). Carney and Crump are also both terrific listeners who aptly balance the shifting focus of what the other guy is doing, their instrument-grounded idiosyncrasies and the path on which each sound takes them. However, the feature that moves these improvisations from stellar to august is an attention to a global formal construction (this might be attributed to the fact that both men have day jobs as award-winning composers and / or instructors on the subject). Sure the scenes change � rapidly � but everything fits together in the obtuse manner that card catalogs make sense to veteran librarians. As mentioned, this group is a tenuous affair: Crump has his Rosetta Trio and HBO scores, and Carney divides time between being a national visiting artist in residence and gigs with Christian McBride, Nels Cline etc. But the duo's connection is undeniable, and one hopes that time will allow a future for this yin and yang.